There is a discussion running at EuroBricks because someone reported to have found in a new set, two different types from part 3711 (TECHNIC Link Chain). As visible from the pictures below the new design (topside) seems to have got some more plastic and thus been reinforced. 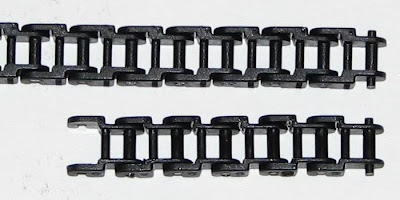 This particularly visible in the gap reduction at consecutive chain elements linkage. 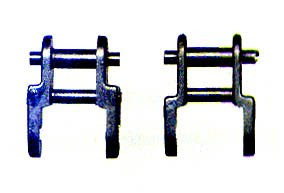 Although part characteristic dimensions and elements spacing, remains unchanged. As a matter of coincidence, at the same time Mauricio from iLe9os wrote me to report the exact same situation. In his picture bellow we may easily compare the differences between the old and the new molds, in a side-by-side photo. Not that I'm aware of many reports about these parts to break in service (specially if we realize at some applications like some pneumatic engines using these parts and reaching thousands RPM) but it looks that effectively TLG has come with a redesign for this part. Maybe this small modification turns also the production process more reliable and thus cheaper!? So it won't be because of the Link Chains, that guys at LPE Power won't be able to push even further, some of their motors. Meanwhile it seems customers have some probability two find both types mixed, whenever they open a new box. At least until TLG manages to exhaust all the old parts from their stocks. Thicker side walls = less gear clearance.. Wondering if anyone has tested to see if they ride-up on the gears any more than the original? Iv'e never had these parts break but I have had them come apart. You know how the engine in the 8880 was driven by chain, when that came off it was quite fiddley to get back on. I wonder if these new links will help to prevent this. I've always read online that the old links (these and their wider versions) are very fragile, although fortunately I never managed to break any. I never subjected them to much stress, anyway. Parax, I don't understand what you meant by gear clearance: from what I understood from the pictures, the difference is only on the outside of the links, not in contact with any meshed gears. Well maybe now that the links are a bit wider, they might be harder to fit into tight spaces. 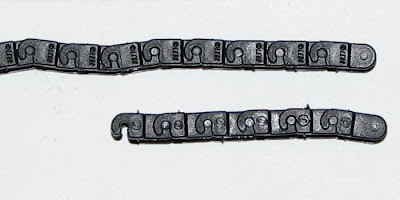 From the picture, it seems the total width is unchanged; it's just that the widest part of the link, the arms, now extends further into the middle rod, perhaps making them stronger and harder to bend/break. I think that, on lightly loaded mechanisms, using the older kind or the newer one will be completely indifferent.